Abu Dhabi (Agenzia Fides) - "As a multicultural event that encourages compassion, respect and understanding among different communities, cultures and religions, the gathering enables us to counter extremism, prejudice, hate, aggression, greed, and oppression that violate the very idea of human fraternity", is a passage from the speech by Sheikh Nahyan bin Mubarak Al Nahyan, UAE Minister of Minister of Foreign Affairs, at the opening of the Global Conference of Human Fraternity, held from 3 to 4 February in Abu Dhabi under the patronage of Sheikh Mohammed bin Zayed Al Nahyan , an event that hosts the Great Imam of Al Azhar, Ahmed El-Tayeb and Pope Francis, as well as numerous religious figures from around the world. 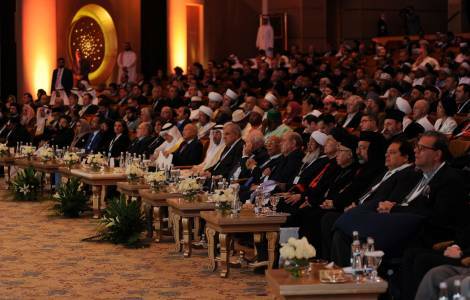 The minister noted: "The Conference the provides a rare opportunity to unleash the power of wisdom and reason, and learn from the ideas shared by the eminent personalities", expressing the nation's commitment to tolerance and promoting peaceful coexistence among different communities all over the world. The Conference focuses on three themes: "The principles of human fraternity"; "Common responsibility for achieving human brotherhood"; "Human fraternity: challenges and opportunities". Marco Impagliazzo, president of the Community of Sant'Egidio, intervening in the assembly, remarked: "Mission of religions is to make the love that radiates light and life known, which makes us recover the desire for peace, hospitality and goodness. To win the war. To achieve a more fraternal world. To make friendship grow. Religions remind all this to a forgetful and frightened humanity. And, with all men and women of good will, testify that peace is always possible. We must seek it without fear. God does not abandon the world to evil and the logic of violence, but comes to the rescue of our prayer and multiplies our efforts for peace".